If you were to describe Emma Stone, the first word to come to mind would probably be “quirky”. You might even call her classic, cool and 1,000-percent relatable. 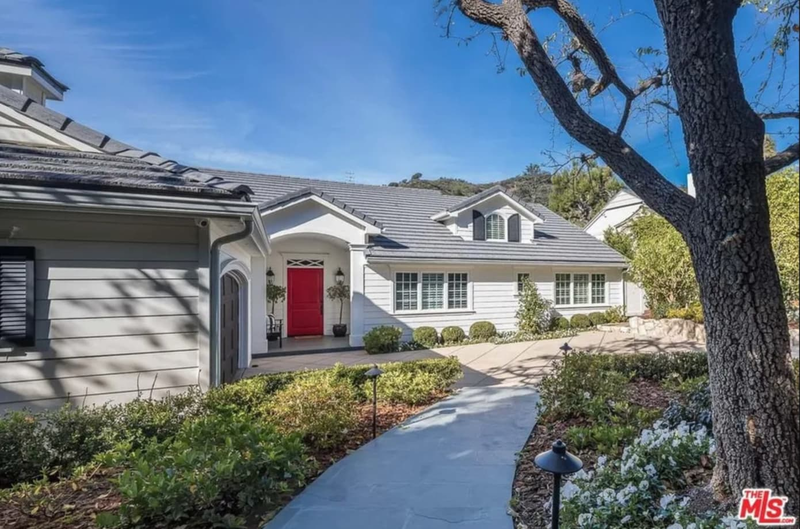 It just so happens that’s exactly how we would describe her Beverly Hills, California home, too which the La La Land actress recently listed for nearly $4 million. 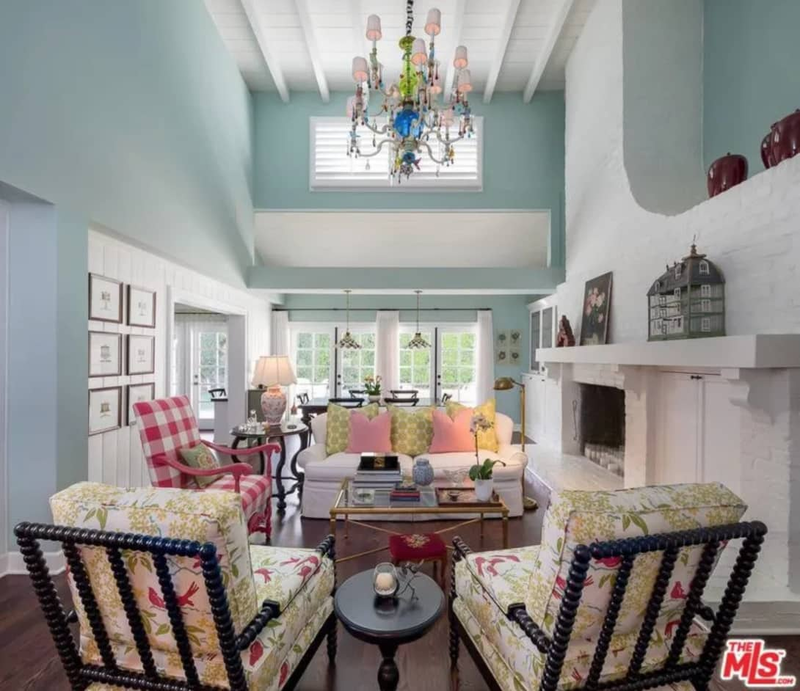 Tucked away in the Coldwater Canyon area of Beverly Hills, the over-3,800 square foot, four bedroom and four-and-a-half bath home is charming from the outside, with a bright-red door greeting guests. But inside? 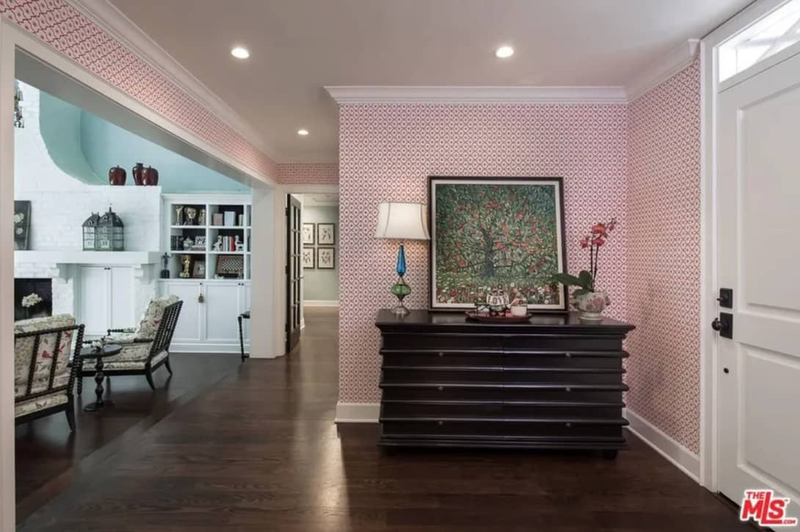 Stone went to town decorating the 1950s home with bright, vibrant wallpapers throughout, with colorful furniture and statement pieces punctuating various rooms. Let’s start with the foyer, with its eye-catching red and white geometric wallpaper. Clearly, Stone isn’t afraid of a little (OK, a lot of) color. Just steps past the foyer is the living room with Easter-blue walls. The multi-colored chandelier hanging above the space perfectly complements the pink and green furniture. 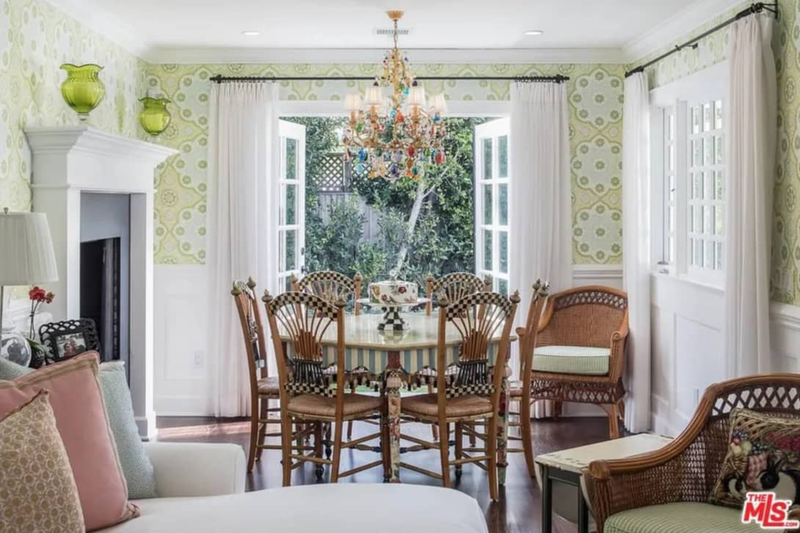 Adjacent to the kitchen is a space with a dining table with a similar chandelier, suspended above a MacKenzie-Childs dining table, detailed with a black-and-white print, a print you’ll see echoed in the guest bath. 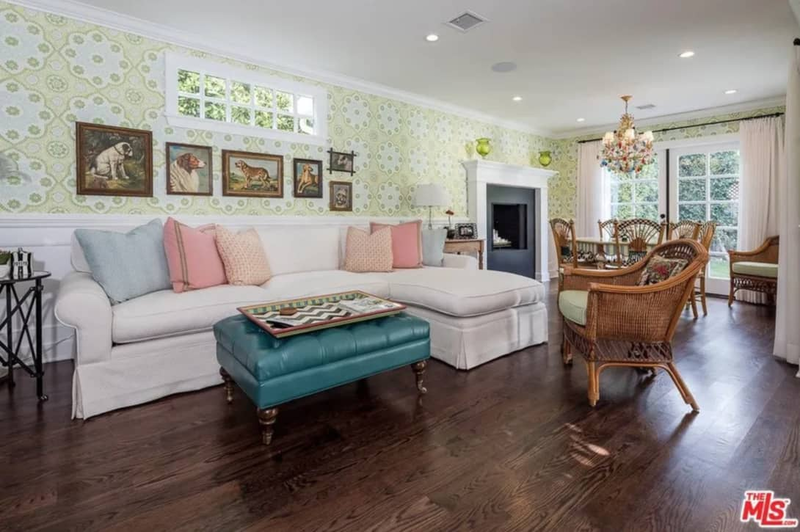 The bright-green, printed wallpaper stretches across the lounging space. 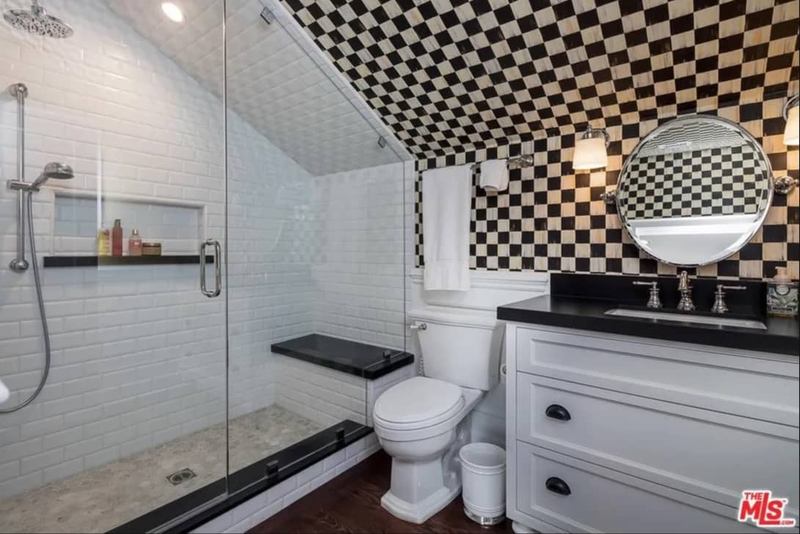 The guest bathroom is simpler, comparatively, maintaining that black-and-white color scheme. The master bath, on the other hand, has the same Tiffany-blue walls found in the living room, but this time with black accents. 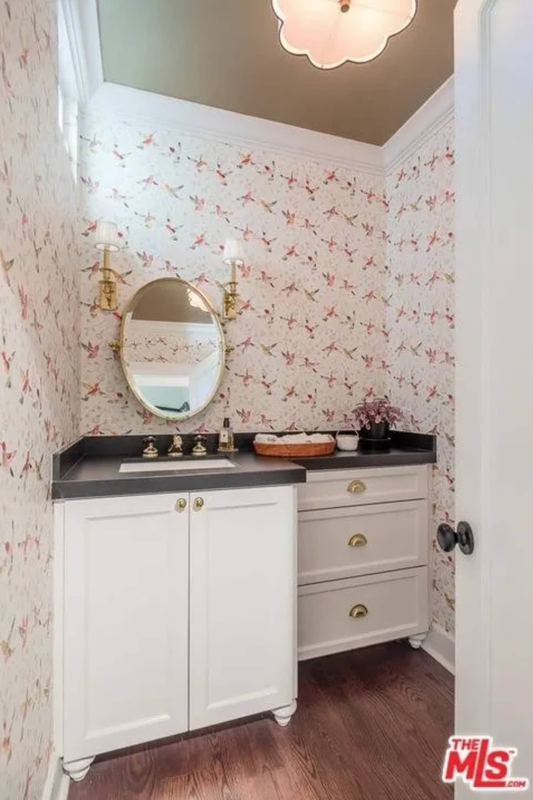 The vanity is vintage-inspired with pink wallpaper and gold accents, from the mirror and sconces to the faucet and drawer and cabinet handles. Now we must know: Where did Stone purchase her wallpaper? Because her home provides for some serious home makeover inspo. If you love Stone’s funky color choices as much as we do and have an extra four million bucks laying around, head on over to Compass and buy it. Then invite us over.